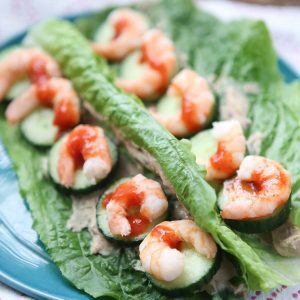 Shrimp and Hummus Lettuce Wraps are great for quick lunches or dinners – only 263 calories per serving and 21 grams of protein! Great low carb meal if you are trying to lose weight. I’ve officially been logging my food into My Fitness Pal for 36 days. That’s a huge accomplishment for me! The first week I started, it felt cumbersome and time consuming but by my 5th week it’s become a breeze. Most of the food I eat regularly is already there and I’m finding I try to eat a lot of the same or at least similar meals (I’ve read that eating similar “predictable” meals each day is a habit of fit people – I agree!). I’m down about 5lbs and feeling really good. 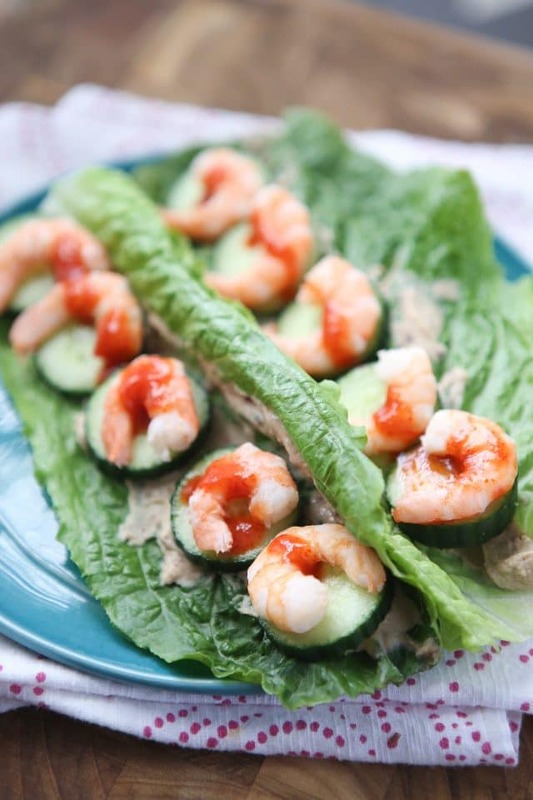 One meal I have in rotation this past month are these Sriracha Shrimp and Hummus Lettuce Wraps. They are pretty basic and easy to put together, and quick! 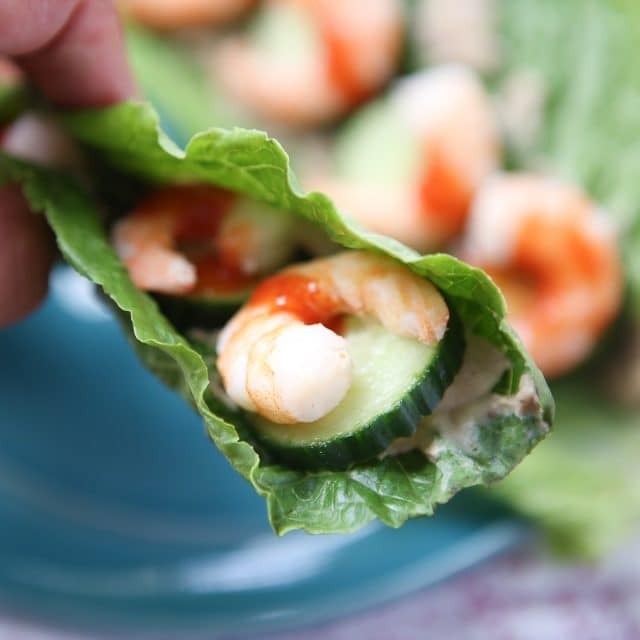 You can use frozen cooked shrimp that you’ve defrosted (that is what I’ve been doing) or roast up a bunch of shrimp and eat in salad or wraps like this over a couple of days. I’ve been loving lettuce wraps like this lately as a change up from my usual salad. I goofed and forgot to add avocado when I took the photos of this the other day. Make sure you add a few slices of avocado, it is so good in it! (Note: the avocado is already included and calculated into the nutrition info). Sorry about that! Some of my other go-to meals I like to rotate are: Garden Salad with Shrimp and Bacon, Black Bean and Egg Tostadas, Blueberry Banana and Peanut Butter Oatmeal, and Mediterranean Chopped Tuna Salad. You’ll have to let me know if you’re on My Fitness Pal, I’m aggiegoodman there – I’d love to connect! If you have any go-to meals you rotate into your daily meal plan regularly, please share with me, I love getting new ideas. Have a great week! Spread hummus evenly on 2 romaine lettuce leaves. 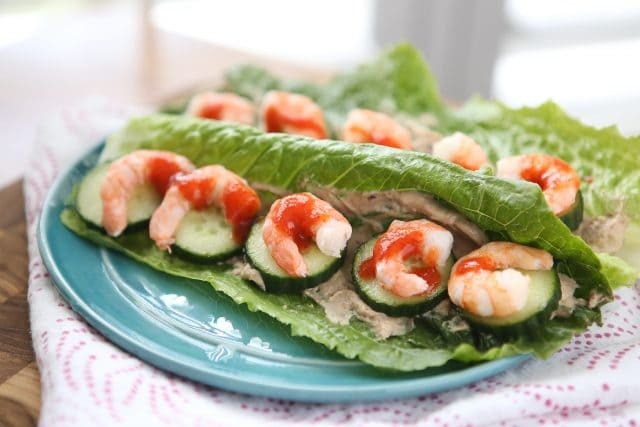 Layer cucumber slices and shrimp, season with salt and pepper, then drizzle with sriracha, to taste. Top with avocado slices. Yum, that looks so delicious! Thanks for the shout-out for my Asian Lettuce Cups. Those are popular in my extended family!